Nation is the first novel in some time (since the 1996 novel Johnny and the Bomb) Terry Pratchett has written that is not a part of the Discworld series. Sir Terry had apparently been ready to write it for four years and could wait no longer. Primarily aimed at children, Nation is everything that could be expected from this master of story telling. Mau awakes to find himself the last survivor of his people, his whole Nation washed away by a ferocious storm. He soon finds however that he isn't quite alone on his island, meeting Daphne, the only survivor of the ship Sweet Judy. Together they are the beginnings of a new Nation on an island that holds many secrets. Terry Pratchett has to be one of the single greatest writers of the last 100 years, not only does he manage to create stories that feel so personal - as if he is writing just for the reader - but his ability to tell those stories with a positive, witty humour and then manage to fill them with so many powerful messages is simply stunning. There is such an incredible feeling of optimism contained within, a confidence that never once wavers and manages to hold the reader within that magical realm. 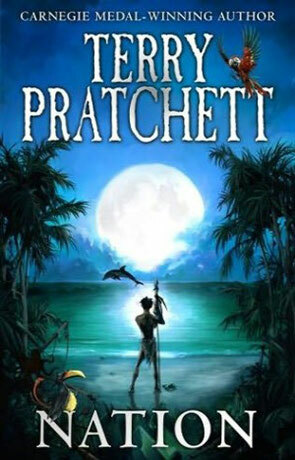 It's quite refreshing to read a Pratchett novel that takes a break from the Discworld - not that there is anything wrong with that glorious place but the story told here demanded a different, spherical world to really do it justice. Set in an alternative world almost the same as ours with really very minor differences, taking place around the year 1860 (Charles Darwin's On the Origin of Species has just been published) and mostly set on a small island amidst an island chain somewhere in the Great Southern Pelagic (Pacific) Ocean. There are a number of ideas and messages presented within the book while two main themes of the relationship between individuality and society along with the development of a received child identity to that of an adult self created one run alongside those of Theology and passive faith, the philosphy of humanism - along with love, the notion of nationalism, courage, race and loyalty. Nation is an incredibly rich story with engaging characters, the unique style of Pratchett and an unbounded intelligence, the perfect book for all age groups. Written on 15th February 2013 by Ant.